If you watched BBC’s Winterwatch this week you will have seen some beautiful mountain hares picked up on the show’s infrared cameras. What you might not have realised is that we are currently in peak mountain hare culling season in Scotland. Mountain hares are protected by a closed season which runs from 1st March until 31st July. Outside of this period, this iconic species is killed as part of large-scale culls to manage land for red grouse shooting and can also be shot freely for sport. OneKind has long-campaigned for an end to mountain hare culls in Scotland. Our current open letter to the Scottish Government has been signed by over 14,800 people and will be handed in this Spring. If you haven’t signed it yet, then please add your name here. 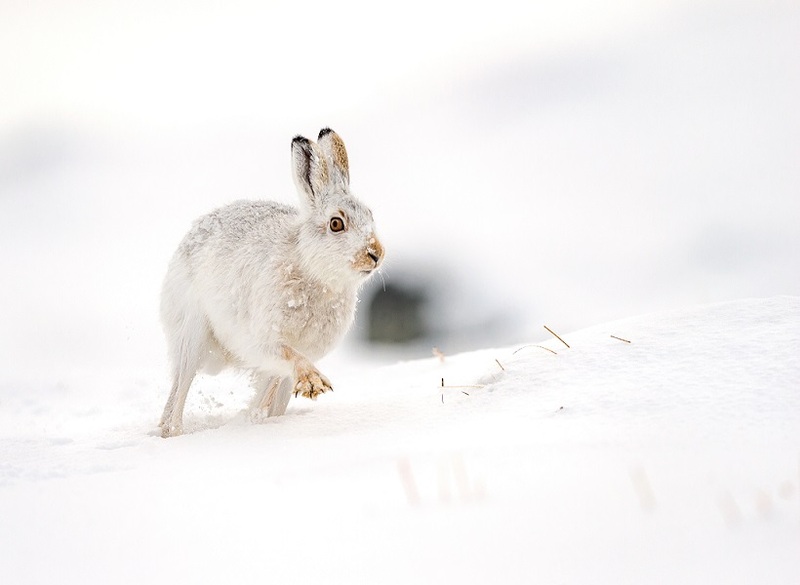 Before then, here’s five things you might not know about mountain hare culls in Scotland. Last year, Freedom of Information rules revealed the true extent of mountain hare culls in Scotland. Until then, the only estimated number of mountain hare killed was 24,529 over a one-year period in 2006/7. However, the new data showed the total number actually fluctuating at around an average of 25,961 and reaching as many as 37,681 in 2014. In 2015, the most recent year for which an estimate was available, estimated that 26,952 mountain hares were killed. In August 2018, the catastrophic decline of mountain hares was revealed by a long-term study from one of Scotland’s most renowned ecologists, Dr Adam Watson which which showed the mountain hare population in the eastern Highlands was just 1% of the level recorded in 1954. There are serious animal welfare concerns surrounding the culling of mountain hares. Since the killing is unregulated and often happens out of sight, it is difficult to scientifically assess the animal welfare impacts, but given the large number that are killed, it almost certainly causes extensive suffering. Shooting any small animal in the wild can be very challenging and there is a high risk of injury rather than a clean kill. This was shown in footage which was released by OneKind last year in which a hare was injured by a gun before suffering a prolonged chase and death by a dog. Despite this statement from the Scottish Government and previous calls for “voluntary restraint” on large-scale mountain hare culling, culls are still taking place across Scotland. Not only does this result in further suffering and persecution of this native species, but it also undermines the authority of the Scottish Government. Most mountain hares are killed as part of localised culls on shooting estates by gamekeepers managing land for red grouse shooting. Estate managers believe that eradicating mountain hares can help control louping-ill, a virus that affects red grouse and is transmitted via ticks carried by the hare and other mammals. While there is no doubt that mountain hares carry ticks, there is no clear evidence that culling them is an effective way of managing red grouse numbers. In fact, a 2015 report to the Scientific Advisory Committee of Scottish Natural Heritage concluded that “there is no clear evidence that mountain hare culls serve to increase red grouse densities”. Yet we are still killing these animals in large numbers under the pretence that it will make higher numbers of red grouse available to be shot for fun. Shooting mountain hares is also one of the many “country sports” offered by Scottish game estates. In our 2017 report, Mountain hare persecution in Scotland, we found 25 companies in Scotland which offer mountain hare hunting with many offering dedicated mountain hare packages or mixed bag packages that include mountain hare. This can attract shooters from around the world, with companies usually offering bags of 8-10 animals per gun for walk-up hunts and up to 200 for a driven shooting party. Following our report, some of these companies removed the mention of killing mountain hares from their web pages but others are still offering the chance to shoot these beautiful animals. It’s time to stop marketing Scotland as a place to shoot our beautiful animals and increasingly threatened wild animals. Do you want to help protect Scotland’s mountain hares? In the next few months we’ll be handing in an open letter to the Scottish Government calling for this year’s open season to be the last. If you haven’t signed yet, then you can add your name here. By shooting the hares, they are removing them from the food chain for raptors, which will then have to target Grouse!!! Morons. I won’t be visiting Scotland and supporting the tourism economy there while the persecution of upland wildlife is for reasons of perverse pleasure is tolerated. I believe that the mass killing – let’s be clear about this! It is not “culling”! It is killing for fun. It makes money! Grouse are far more at long-term risk from climate change than from hares or the ticks they may carry. The last wet winter and hot summer took its toll, and this pattern could become the norm. IT is mass murder of a species for cash! Hunting and shooting make me feel sick. Killing for fun. Please put pressure on the Royal Family – big landowners in Scotland I think – to stop hunting and shooting on their land. They make a big show of environmental concern elsewhere, eg Prince Charles worrying about red squirrels and Prince William talking to Attenborough at Davos. They could really do something.